We know cars are terrible polluters and emit a huge chunk of the world's greenhouse gases. But how many people are prepared to give up their car for the good of the planet? In Vauban, a district on the outskirts of Freiburg, a city in southwestern Germany, the answer turns out to be quite a few. For the past decade, cars have been banned in most of Vauban. Streets are devoid of vehicles and there are tough disincentives for car lovers: no home garages, no street parking and a charge of some $30,000 for a space in one of two multi-storey car-parks. The impact has been dramatic: the car-ownership rate among the 5,000 residents is just 220 per 1,000, compared to 520 in Freiburg itself. Perhaps the most surprising thing about the district's experiment in carlessness is that it was local residents who pushed the idea. 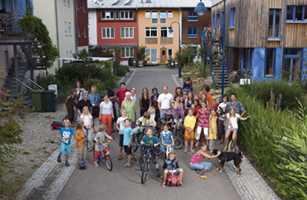 "Lots of people got together and they sat down with the local council and came up with the idea of a reduced-car community," says Roland Veith, the Vauban project leader from Freiburg city council. Though Vauban is the most densely populated district of Freiburg, you don't notice any pollution. There are generous green spaces and good public transport links  including fast buses, an efficient tram service and a myriad of cycle paths. "There's more space for community life," says Almut Schuster, 49, a singer and resident. "It's like being in the countryside, but I'm living in a big city. I don't have to worry when my child plays on the road because there are no cars." Schuster belongs to a car-sharing club so on the few occasions that she needs a car, she teams up with other residents and shares a lift. Like many people in Vauban, she also lives in an apartment in which the water is heated by a roof-top solar panel and the power comes from a supplier who uses renewable sources such as a local wood-chip fired power plant. "There are many options for using renewable energy at home. We all share this planet and we need to be conscious of how we live and what we eat," she says. Andreas Delleske, a 44 year-old energy consultant, helped build the area's first passive houses and apartments  there are 270  back in 1997. Delleske's own apartment is part of a south-facing block which uses triple glazed windows and a co-generation unit in the cellar that produces enough electricity and heat to supply 60% of the residents' power needs and 30% of the hot water demand. "I live in a 90 square meter [970 sq. ft.], 3-bedroom apartment and I pay around 200 euros ($286) for heating and electricity costs  and that's not each month but every year," says Delleske, who organises tours of Vauban for visitors from abroad. And it's not just savings and carless streets that make Vauban so attractive. "All the residents had the chance to plan their own city," Delleske says, "and it's just how we wanted it to be."